December 12, 2018, 6:00 p.m.
Just how long with Special Counsel Robert Mueller’s investigation last? Just over one in five in the latest Economist/YouGov Poll believe it will end in the next few months – by the spring or even earlier – but more say it will last longer (and many say they have no idea how long it will go on). Democrats are somewhat more likely than Republicans to see it ending soon. The investigation has been seen through partisan lenses pretty much from the start. Today, although a majority approves of the appointment of a Special Counsel to lead the investigation into Russian involvement in the 2016 presidential election campaign, a majority of Republicans do not. One and a half years ago, near the beginning of the investigation, an even larger majority of the public overall approved. 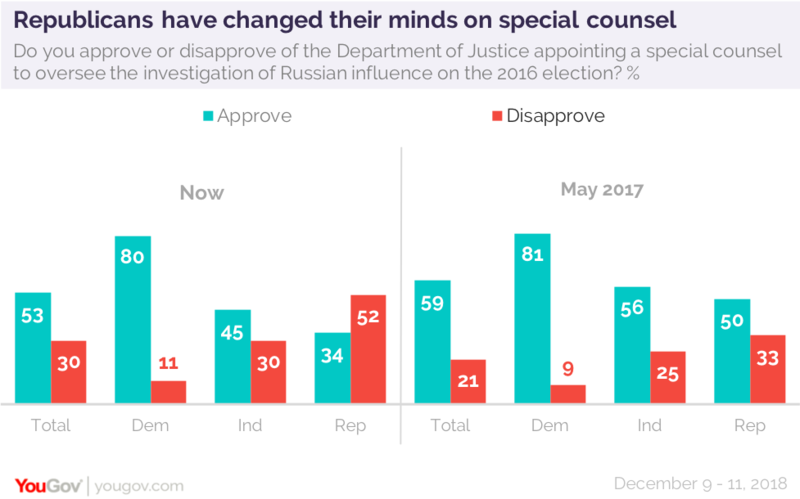 Republicans, while somewhat less supportive of the naming of a Special Counsel, agreed. But as the investigation went on, Republicans have changed their minds. Republicans have changed their minds even more when it comes to Special Counsel Robert Mueller himself. In May, 2017, Republicans were just as likely as Democrats to have a favorable opinion of Mueller (though about half in each party said they weren’t sure what they thought about him). Since then, the percentage of Republicans with a favorable opinion of Robert Mueller has dropped 22 points, and the percentage saying they are unfavorable has risen 51 points. In mid-2017, 36% of Republicans were favorable, and only 13% were not. Now those figures are 14% favorable and 64% not favorable. Democratic opinion of Mueller today is almost the mirror image: 64% of Democrats are favorable, 18% are not. Just about half the public expects the Special Counsel’s investigation will produce evidence of a Trump campaign conspiracy with Russia, but just a third think there will be strong evidence. 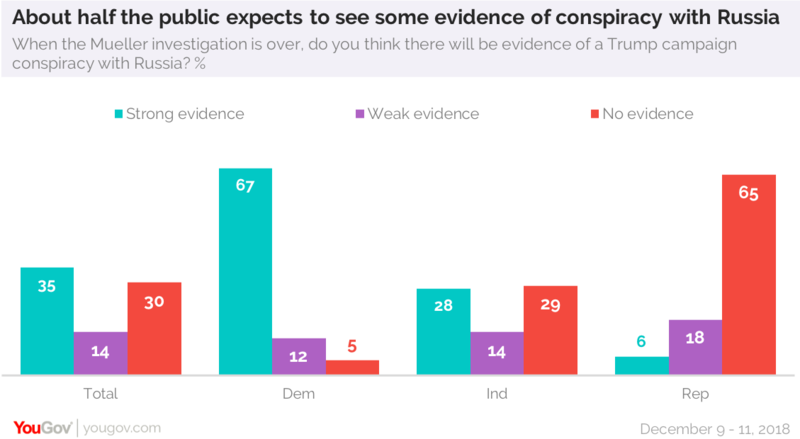 Nearly as many think there will be no evidence of a conspiracy. There are clear partisan differences in these expectations. Large majorities of the public – including majorities of Republicans – would give prison sentences to three of those who have been indicted in Mueller investigation: former campaign chairman Paul Manafort, former National Security Adviser Michael Flynn, and President Trump’s former personal attorney, Michael Cohen. Republicans, however, would be lenient in the cases of Manafort and Flynn. Majorities of Republicans support light sentences, or even no prison time for those two men. There is far less difference between Republicans and the public overall when it comes to Cohen. There is no question that what these men have pled to – as well as what they are accused of – are things Americans believe should be punished with incarceration. 91% believe lying to the Federal Bureau of Investigation is a crime that should be punished with jail time (although only a third believe it should be a “substantial” sentence). More than nine in ten would send someone who engaged in money laundering to prison (though again, just a third would make it a substantial sentence). Hack into someone’s email? More than nine in ten would send you to jail, but just a quarter would make that sentence substantial. As for someone who worked for a foreign government to influence American elections, 93% would send someone who was convicted of that to jail. 58% would make that sentence substantial. 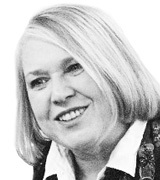 There are crimes that even more say deserve stern punishment – murder for one, but also sexual assault. 72% would punish someone who sexually assaulted a woman with substantial jail time. Women are more likely than men to say that.